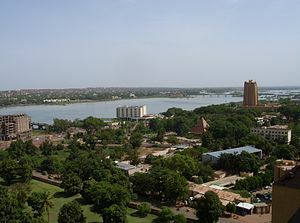 'S e prìomh-bhaile Màili a tha ann am Bamako. Tha e suidhichte air bruach an Abhainn Niger ann an iar-dheas na dùthcha. 'S e seo an co-chomharran aige: 12° 39’ Tuath agus 8° 0’ Iar . Tha Bamako 714km air falbh bho Chonakry (Gini), 442km bho Yamoussoukro (Costa Ìbhri), 1,100km bho Niamey (Niger) agus 1,011km bho Thiombuctu. Tha e suidhichte ann am meadhan na dùthcha, aig 350m os cionn ìre na mara. Anns a’ bhliadhna 2006 bha 1,690,471 duine a’ fuireach anns a’ bhaile fhèin. Mar sin dheth 's e am baile as motha den dùthaich a tha ann. Canar gur e Bamako am baile a dh’fhàsas as luaithe a-rèir àireamh-shluaigh a tha ann an Afraga. 'S e teas meadhan malairteach a th’ ann agus tha port aige. Tha gnìomhachas aodaich, meatailt agus iasgaich gu math làidir. Thàinig an t-ainm Bamako às a' chanan Bambara, tha e a' ciallachadh "Boglach Chrogaill . Musée nationale du Mali, Taigh-tasgaidh nàiseanta Mhali. Pont du Roi Fahd, far a bheil am port-adhair eadar-nàiseanta Senou International Airport. Tha an rathad-iarainn Dakar-Niger Railway (eadar Koulikoro, Màili agus Dakar, Seanagal) ann cuideachd. Sako: (1946 -) Seanachaidh (Griot). Amadou Bagayoko: (1954 -) Seinneadair dall. Miriam Doumbia: (1958 -) Bana-sheinneadair dhall. Toumani Diabate: (1965 -) Seanachaidh (Griot). Air a tharraing à "https://gd.wikipedia.org/w/index.php?title=Bamako&oldid=501106"
Chaidh an duilleag seo a dheasachadh 28 dhen Iuchar 2015 aig 19:49 turas mu dheireadh.